Through support, Matthew Loucks bounces back from health care, medical issue turmoil. If you were to ask Matthew Loucks, he would tell you he is a lucky guy — all the way back since his days at Clackamas High School, where he met Becky, the girl he would marry. He got a great job right out of school, a nice house in the country, and became a proud dad to Hope, Emily, Andrew and Cody. "That's kind of when the wheels fell off the wagon," Loucks said. There were two bouts with cancer, warning signs for a third, and surgeries for other conditions. Unable to work, Loucks lost his job, his health insurance and his home. Yet today, lucky is still the best way to describe him, thanks to support he received from a group focused on creating healthy lives for everyone in the community. 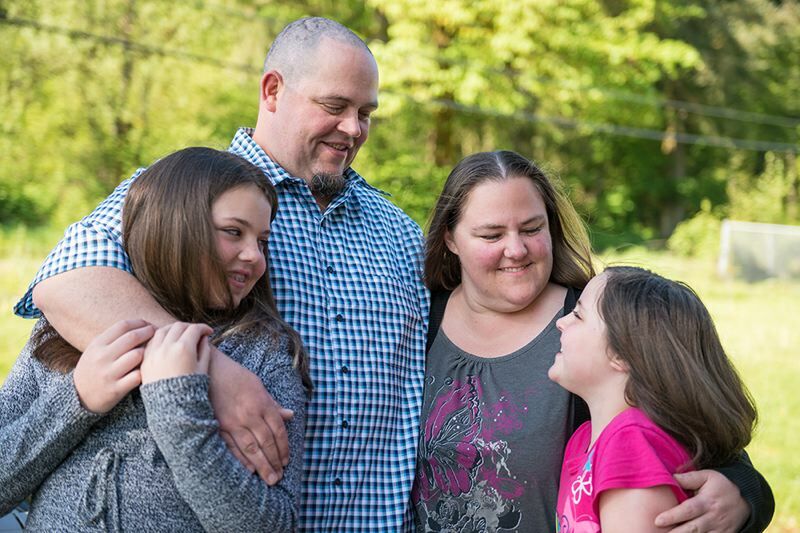 CareOregon, a nonprofit community benefits company that's been involved in health plan services, reforms and other innovations, helped find solutions for Loucks and his entire family. Loucks first realized something was amiss while working as a warehouse foreman. One day at work he felt a sharp pain in his groin — almost like he had been hit. "I didn't really think anything of it, but I went to the doctor," he said. "They gave me some ibuprofen for it and I was like, 'OK, that's fine.'" Ten days later, still feeling pain, the doctors ordered an ultrasound. Soon, Loucks was on the operating table for testicular cancer. He opted not to go through chemotherapy, but he still needed to go through additional treatment and follow-up scans. "When they were doing the scans, they found out that I had lumps all over my thyroid," he said. "So, they went in and did biopsies, and from that they were able to figure out it was cancer, too." Treatment for his thyroid had to wait until the testicular cancer had been dealt with. By that time, the cancer had spread and the only option was to remove the thyroid. The medical insurance Loucks had through his job had helped cover his cancer treatment and also was there when he needed back surgery and a full corneal transplant for a degenerative eye disease that left him legally blind. But despite the insurance, Loucks' family found itself in debt for more than $100,000. The warehouse where he worked closed, so away went the insurance. Then the family had to sell the house. Finally, they were faced with the toughest decision — whether to pay for medical treatment or other bills. "I always felt bad because my wife was having to take care of me plus the kids at the same time," Loucks said. "There was a lot of stuff I couldn't do ... getting up to help change a diaper, I couldn't move to do it because of my back or my treatments." The family began to get back on track, but was still faced with the difficulty of finding new health insurance. Loucks will need monitoring and possible treatments for the rest of his life, while his child's peanut allergy requires Epi-Pens that must be replaced regularly for $300. So when the Affordable Care Act allowed Oregon to expand Medicaid, Becky decided to sign her family up through CareOregon and the Oregon Health Plan. "From that point on I didn't have to worry about making my health secondary to my bills," Loucks said. "I could actually go and see my cancer doctor, go have my CAT scans, go do all this stuff and not be worried about how I can't pay the water bill this month because I have to pay this doctor." "It was heaven-sent for us," he said. CareOregon's mission is cultivating the individual well-being of people like Loucks. "I don't think any family should ever have to worry about putting their health secondary to their water bill," he said. "If I didn't have health insurance, I wouldn't be here with my kids." These days Becky still works while Loucks stays home. They care for his grandmother, who lives with them. Loucks picks up his kids at school and loves to make them Crock-Pot slow cooker meals. He also treasures watching his daughter Hope excel as a softball pitcher. Despite all of the hardship, Loucks still considers himself fortunate. "No family should have to go through what I did," he said. "I couldn't imagine looking at my kids and saying, 'Sorry, we can't afford to keep dad alive.'"